The 54th ranked University of Utah men’s tennis team (4-1) will host a double header this upcoming Saturday, February 14 at the Eccles Tennis Center. The Utes will face Northern Colorado (2-2) at 11 a.m. MT and No. 64 Denver (3-4) at 5 p.m. MT. 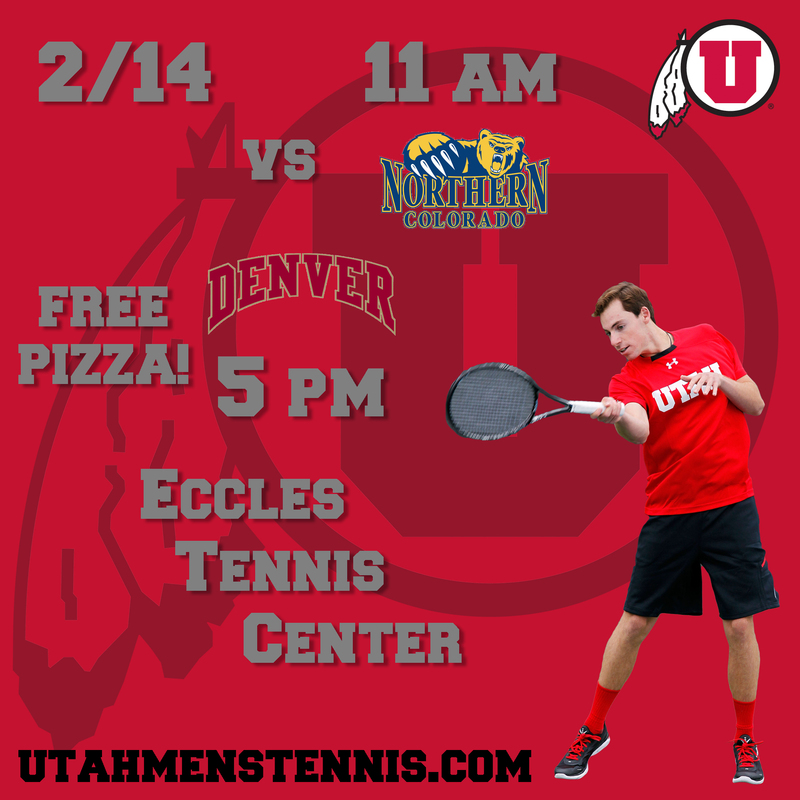 FREE PIZZA will be served at the start of singles play against Denver. “We look forward to another great weekend of tennis at the Eccles Tennis Center,” said head coach Roeland Brateanu. No. 54 Utah is coming off a bye-week. The Utes has a successful home-opening weekend two weekends ago, posting a 3-0 record. Utah earned wins over then 70th ranked Utah State, Montana and Montana State. Northern Colorado lost at home to Montana State 2-5 last Saturday. The Bears’ overall record is now 2-2, but they will face No. 73 Utah State on Friday before making the trip to Salt Lake City. “They are a tough team and I expect them to come in here with a lot of excitement. We’ll have to play good tennis to beat them,” said Brateanu. No. 64 Denver fell to Nebraska, 3-4, in Denver, CO. last Saturday. The Pioneers are 3-1 on the road this season, clinching victories over Furman, North Florida and Cornell. Denver’s Henry Craig is ranked No. 113 in the nation in singles play. BYU will host Denver on Friday. Last year, Utah was edged in a 3-4 loss by a 52nd ranked Denver team in Denver, CO.
“The matches between us and Denver are always very close and the last 4 years have been decided by the last match on. I expect another great battle against one of the premier teams in our region,” concluded Brateanu. As always, admission and parking in the lot west of Guardsman Way are free. FREE PIZZA will be served against No. 64 Denver during the beginning of singles play. This entry was posted in Schedule/Results and tagged Denver, Free Pizza, Northern Colorado, Roeland Brateanu, Utah Utes. Bookmark the permalink.